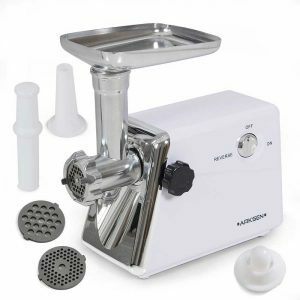 Meat grinders are not the most common piece of equipment you might find in a kitchen, despite the fact that they are incredibly useful for a huge variety of common food preparation tasks. 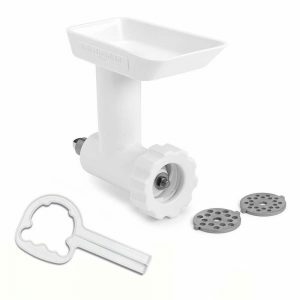 This scarcity means that most people have absolutely no idea what to look for in a quality, reliable meat grinder, or how to even tell one unit apart from another. This guide is here to clear the air on meat grinders, answering your questions and giving you some helpful advice so that you can purchase an amazing new appliance with confidence. 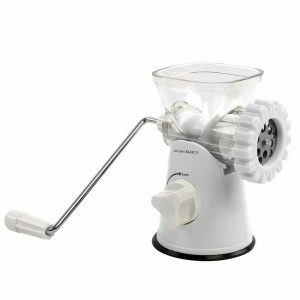 The first place to start on your journey to find the best home meat grinder is the power supply, as this is going to influence a lot of the other factors as well as eliminate certain features and models from your list of potential candidates completely. Home meat grinders are either going to be manual (i.e. you have to use your hands to turn a crank) or electric (where all you have to do is flip a switch to get them going), with each having their own distinct pluses and minuses. (LINK TO MANUAL VERSUS ELECTRIC ARTICLE). Without bogging you down too much on the nitty gritty, choosing between the two comes down to deciding whether or not you want to save money and space or save time and effort. Manual grinders are cheaper and smaller, but require you to do all the work. 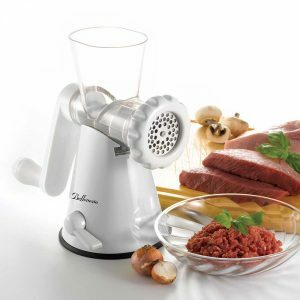 Similarly, electric grinders are bigger and more expensive, but make grinding meat an effortless and simple process. Once you choose between the two, you can start looking at the specific details and specifications of each model. As with any other kitchen appliance, you always want to make sure that you choose a model is going to last you as long as possible and be able to withstand the amount of usage you plan to put it through. 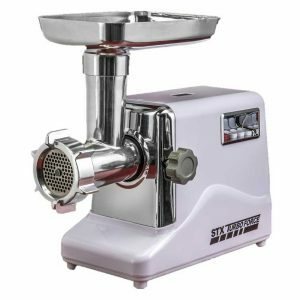 In terms of manual meat grinders, you are usually going to see molded plastic bodies, as they are less expensive to produce but still durable and able to keep the body together. Electric models may also include plastic bodies, though there will be some with metal frames that are typically going to be stronger. For the ultimate level of strength, look for a grinder with a cast aluminum body, as this is a commercial grade metal that is designed to withstand lots of heavy usage. 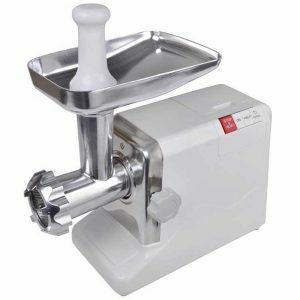 The next most important aspect of any meat grinder is its cutting blade, as this is the component that is responsible for actually cutting up the meat and allowing you to create your ground meats and vegetables. You should always look for a model that has stainless steel cutting blades, as these are going to be very reliable and strong, as well as capable of maintaining a solid level of sharpness over time. Stainless steel is also rust resistant, which is very important in terms of cleanliness and sanitation, since rust can be hard to clean or possibly contaminate your food. This one is more about your own personal comfort level rather than the specific performance of the grinder, yet it’s something that most people tend to forget about or overlook. 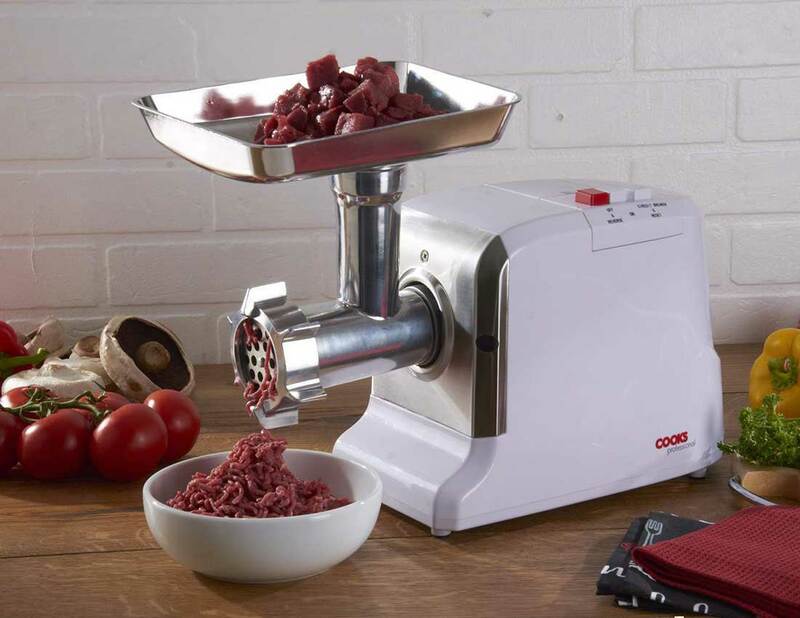 It’s very important that you choose a meat grinder that is easy for you to use and operate, especially if you plan on using it with any kind of noticeable frequency. 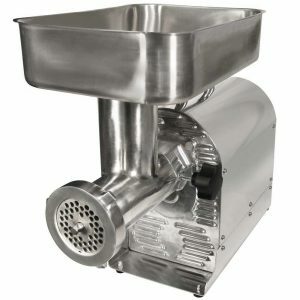 Ease of use becomes even more important when you start looking at manual meat grinders, since they require exponentially more effort to operate compared to electric models. Think about how the output is positioned in relation to the handle (or power switch on electric models) as well as the size and location of the feed tube, since these will impact how easy or difficult it is to actually use the grinder. If it’s difficult to use or position in your kitchen, then you’re less likely to use and are going to end up wasting your time and money. Nobody likes to clean up after a few hours in the kitchen, but proper sanitation and cleanliness is seriously important when you’re working with food, and meat grinders are one of the appliances that require the most care and attention during clean up. Since you are going to be working with raw meat, leaving any behind on the grinder can lead to a buildup of mold or bacteria that could be transferred to your food during the next use, making you very sick. Stainless steel is again a great choice because it’s very easy to clean, especially if the blades and plates are removable. Some models may be dishwasher safe as well, which can make cleanup even easier. Everyone loves getting a few extra goodies with a purchase, and kitchen appliances often have some of the most fascinating and useful accessories around. When you’re looking at a meat grinder, the first accessories you’re going to want is additional grinding plates, as these will allow you to adjust the coarseness of the meat you grind. Some models will only feature two plates (for coarse or fine grains) so anything more than that is really going the extra mile. 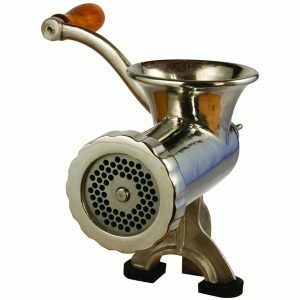 It’s also very common for meat grinders to come with sausage making attachments, which will allow you to grind the meat and feed it into a casing of your choice. Some models may give you attachments with different diameters for different sized sausages, so check the number and sizes of these tools when you can. Other accessories may include a kubbe attachment or a pasta maker attachment, as well as an auger, food pusher, or additional cutting blades. It’s always important to think about the amount of free space you have in your kitchen to make sure that you can actually fit a new meat grinder in there comfortably. For some, this may simply be about the available counter space, as you can easily store a grinder out in the open if you plan on using it frequently. If you want to keep it out of sight when not in use, then you’ll need to make sure you have room in your cabinets or pantry for it. Manual grinders are going to be significantly smaller than electric models, so they make a great choice if space is at a premium in your kitchen. 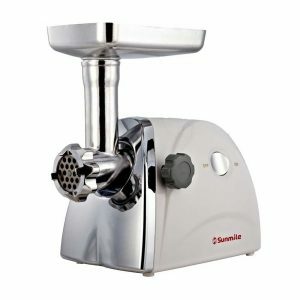 When it comes down to it, choosing the best meat grinder should really be about finding a tool that will make your life easier. Whether that’s because you want a simple, small device to help you make a few hamburger patties and the occasional pot of pasta, or a powerful appliance that will give you an advantage for your bulk food preparation, is completely up to you. Either way, the choice should be easier if you follow the steps and guidelines listed above.